Socks are a small portable project which nonetheless take some time to complete. I did try crocheting socks last year but they were too chunky for my liking. And since the yarn store weekly workshop I run is mainly knitters with the odd crocheter turning up, I have regained some of my former enthusiasm for knitting. 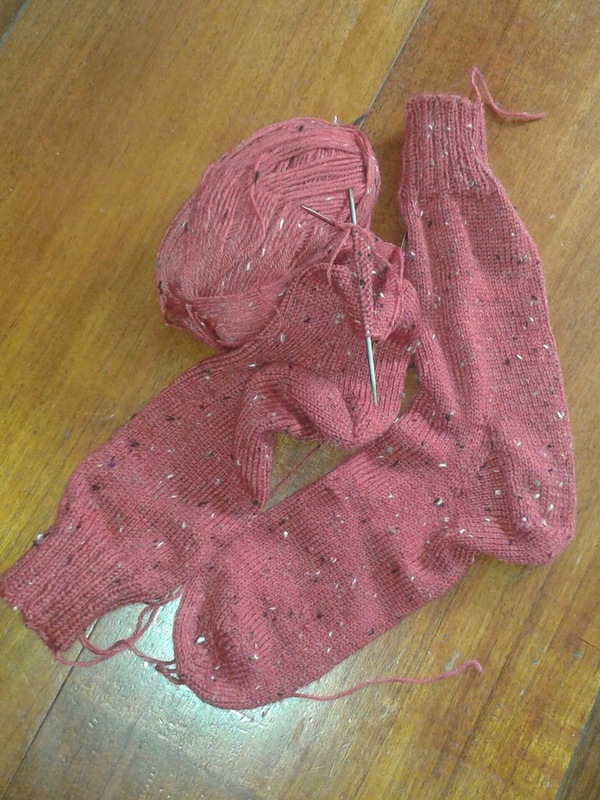 I have lost a former sock project which I took girl scout camping but fortunately had extra double point needles and more tweed KnitPicks sock yarn so began again. I've only ever made one pair of knitted socks before thinking socks with a cable would be a good idea and they aren't wonderful and I don't like the color of the yarn much but I do still wear them. There really is nothing like a pair of hand-knitted socks. They are a joy and an indulgence. Scotland was unseasonably cold and damp this summer so this spurred me on. I chose the more simple sock pattern sans cable from the one of my all time favorite books "The Gentle Art of Knitting" by Jane Brocket.